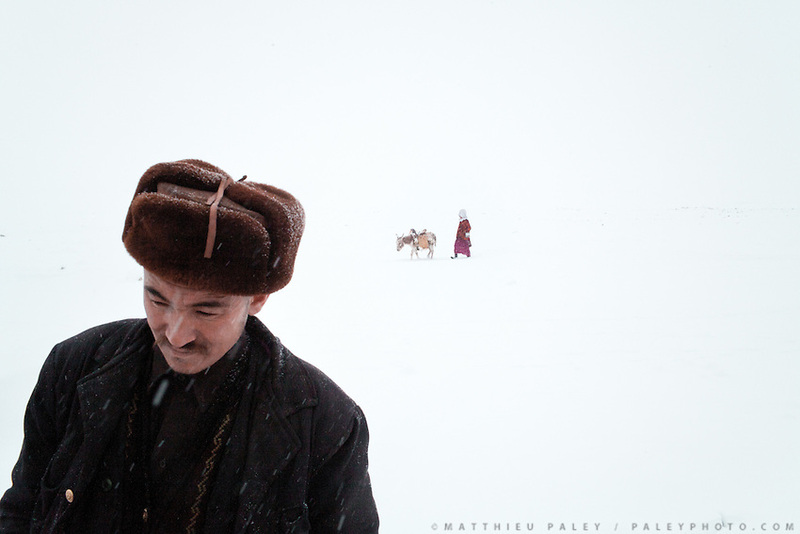 Roshan (foreground), 27 years old, is the son of the late Abdul Rashid Khan, the former tribal leader of the Afghan Pamir. Abdul Rashid Khan was the last khan, not just among the Afghan Kyrgyz, but among any group of Kyrgyz, or Turkic-speakers, anywhere in the world. Roshan is now the current contested "Khan" of the 1100 Afghan Kyrgyz living year round in total seclusion on the Roof of the World at 14.000 feet. Many of them would like to transit to a democratic system - like the rest of Afghanistan - and refuse his authority..His wife is returning from fetching water with the family donkey. Temperature is of -25 F that day...Unique among the Turkic-speaking people, the Afghan Kyrgyz were never collectivized under a colonial power or encapsulated by any state...Trekking with yak caravan through the Little Pamir where the Afghan Kyrgyz community live all year, on the borders of China, Tajikistan and Pakistan.